I got to the domestic airport real early in the morning. It was surreal, especially the area waiting for check-in. It looked like a scene out of a ghost film, or a zombie apocalypse. There were areas which used to be stores or something, but it was empty of goods, or windows, or doors … just boxes. The whole area was also flooded with a very deep, orange light. It was only after the check-in area, and when people started streaming in, did it feel like an airport. I got some breakfast of siew mai and tea, while watching some advertisement, whereby Singapore was the backdrop. Weird! It was probably the season for Japanese tourists, as they are so many of them! It was a crazy day of journeys of randomness. I wanted to go to Mount Popa, but didn’t manage to find the pickup at the local bus station, as mentioned in Lonely Planet. However, the lady selling bus tickets told me to go to Chauk, and somehow find my way up to Mount Popa. This was an epic bus journey, winding through the countryside – the countryside in Southeast Asia really looks the same. I never could tell the difference in landscape from one country of Southeast Asia to the next. Well, I guess there was lots of betel nut chewing. These were available in little packets, like candy! After the drop off at Chauk, I was supposed to miraculously find my way to Mount Popa. First, I bumped into a guy with a horse cart, who offered me a ride to Mount Popa for 1000 kyat. That was 1000 kyat down the drain, because he just drove me 100 m, and left me there. Thankfully, I met a motorbike driver, who then offered to drive me to the Popa Mountain Resort. He also offered to turn back and pick me up the next day. 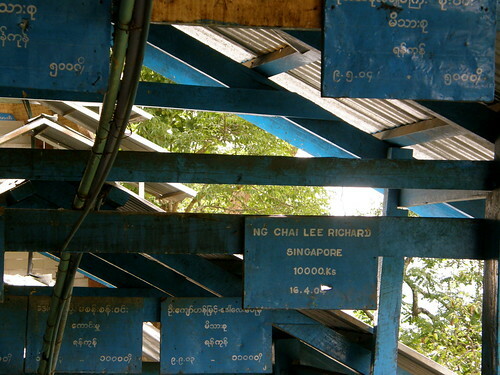 I decided to stay there on the recommendations of G, our resident Burma expert. 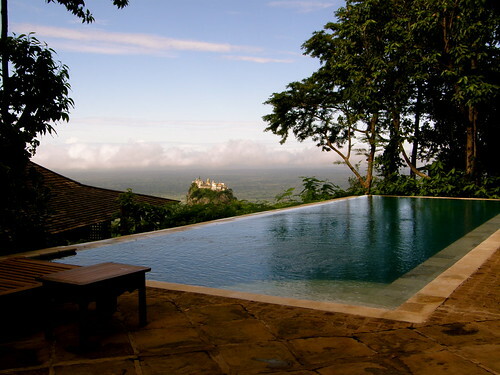 Popa Mountain Resort is certainly a great recommendation. It was set atop a little hill, so it had great views of surrounding areas. They also have an infinity pool with a great view. It appears that I am the only guest. I asked for the US70 cheaper room, but as I was the only person around, they upgraded me to the large suit, which had a king bed, and a porch with a nice view. Unfortunately, there’s no real food around, so you kinda have to dine in their restaurant. Their restaurant is nice, but some choice elsewhere would have been nice. 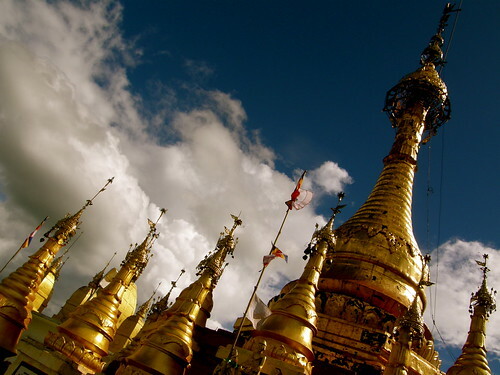 G also suggested I go visit Mount Popa, which has spiritual significance for Burma. I obtained a map from the hotel reception, and just trekked through the jungle. The journey was kinda scary, as I was just following a vague path, with no cellphone reception, and nobody in sight for miles. But I just kept walking and hoping I’ll somehow make it there. The climb to Mount Popa was fairly simple, but the monkeys there were vicious. Thankfully, a very nice Burmese family from Mandalay adopted me. The father of the family wanted to thank some of the deities for bringing him good fortune. I definitely needed their help, fending off the monkeys, and their explanations of the various deities’ functions were also very helpful. After trekking back to the resort, I took a nice soak, had an early dinner, and turned in early. In the middle of the night, there was some crazy shaking in my room – I later found out this was an earthquake. My first earthquake, ever!